Though we may not want to say it, but hair dictates a lot on first impression. One look at Lalomie Washburn's album cover and you know the music is H-O-T even before you put the needle on the black wax and take its title into consideration. It was an immediate 'dis gon be gud', thus, I had to find this record. I had to own this record. Own it so I could frame it and while bobbing my head to the groove, stare at the glorious head of cotton candy Afro-fluffiness that rested on her crown. Washburn's name may strike some familiarity if you like to graze liner notes as the Memphis, Tennessee native began her career as a back-up singer for such soulful luminaries like Ray Charles and Ike & Tina Turner. She mostly paid her dues by scribbling out some of soul's more undercurrent jams for various acts such as New Birth ("You Gave Me Love"), Buddy Miles ("You Don't Have A Kind Word To Say"), and Aretha Franklin ("It's Gonna Be A Bit Better" from Franklin's ill-fated disco set, La Diva), but what really gives her all the cool points is her being the scribe behind some prolific hits and underrated gems from Rufus & Chaka Khan. "Your Smile", "At Midnight (My Love Will Lift You Up)", "Better Together", "I Am A Woman (I'm A Backbone)", and Khan's "Pass It On (A Sure Thing)" from her misbegotten 1982 self-titled album, were all penned by Washburn and if you let them invade your ears, you'll know that she did the damn thing on those tracks. 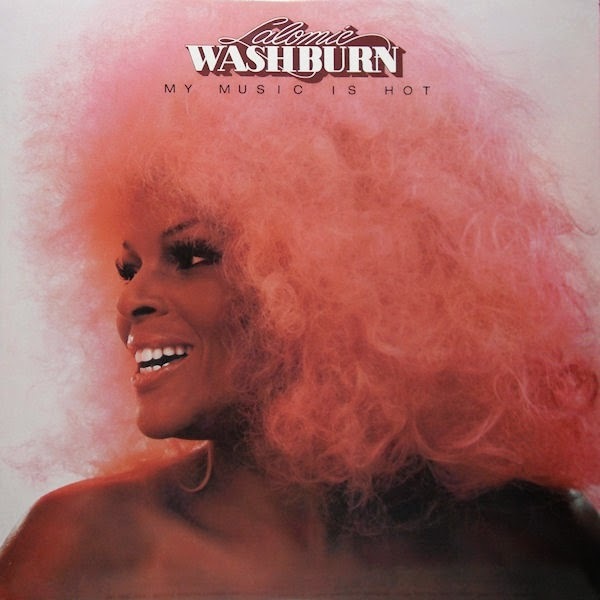 With this knowledge, and my undying love for all things Rufus and Chaka Khan, I was already a fan of Washburn before she even spat out a note, but my Sherlock Homegirl skills were determined to find the physical album of My Music Is Hot. Unfortunately my search led to a dead end as I was sad to discover that My Music Is Hot is out-of-print, but by the grace of the Internet Gods, the album was available to stream via good ol' YouTube. Released in 1977, My Music Is Hot definitely lives up to it's title as it's aflame with crunchy, no-nonsense funk n' soul that is as illuminating and daring as the coif Washburn sports. It's bold on the brass and thick on the bass licks and it doesn't quit until it clocks out after seven tracks. A workout piece for sure. While it's easy to say a lot of soul albums from the 1970s have a somewhat similar vibe, Washburn's debut is different in its breeding. She's a more than capable vocalist, with a voice that edges into the gravely tones of Millie Jackson, but it is rounded out being a savory and powerful kin to Mother's Finest's Joyce Kennedy, and she plays up her Southern charm and sass with each lyrical whip she lashes out, heard prominently on "Shade Of Blue" and the stacked bubbled groove of "What's Love" (my personal favorite). Either penning or co-penning all seven tracks, Washburn breaks off funk in chewable pieces --- from the Funkadelic-esque, "Freaky Strangeness" to the scratching of guitars in "Give Me Love With The Music", to the flourishes of 'low-riding' Latin-Jazz on the title track --- all the tracks are prime and ready for cutting deep to the bone with the legendary Waters brood (Maxine, Julia and Luther) adding more logs to the soulful fire by providing back-up. With all the funkin' going on, what was hotter and tangier in 1977 to where Lalomie Washburn didn't get her due? The explosion of disco with the BeeGees shifting the genre's groundwork with their massive Saturday Night Fever songs, and Donna Summer's breaking the sound barrier with "I Feel Love" might have quelled some of Washburn's fire, as their releases changed the interface of how disco, and soul in general, were to be digested for the remainder of the decade. Disco, at times, 'white-washed' its soulful roots to where it excluded those who still practiced the genre in the raw, and possibly for artists like Washburn, whom didn't flirt well with mainstream's over-glossed ideal of soul music, were simply paid dust. My Music Is Hot is not a disco album. Sure, it's got some grooves that will possess you to form a Soul Train line of your own, but a dizzying chugging dancefloor burner it isn't, unless you're going for the bass struttin' "Double Funkin'" which is supreme funk that foams over the top. Still nothing glossy or fabulously ostentatious is present as My Music Is Hot sticks to being a soulful album that is frayed at the edges with its raw and savory delivery. Sadly, Lalomie Washburn's solo career seemed to end before it even began as My Music Is Hot became her one and only album of prominence, with a few loose singles and a second self-released album following 20 years later. Wikipedia tells me that she became quite popular in Germany, and she continued to write songs and perform all the way up to her death in 2004. Though gone, Lalomie Washburn left behind a great collection of femme-powered funk that places her right alongside other '70s dames who dared to not be tamed when it came down to keeping the funk and its aesthetic sizzling hot to the touch.